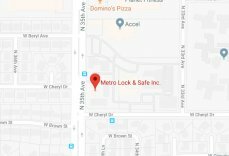 Secure Living Is A Benefit For You | Metro Lock & Safe Inc.
Posted on March 7th, 2014 by Metro Lock & Safe Inc. Secure living can go a long way to keeping your possessions and state of mind protected. There are several different methods you can use to make sure your belongings are well-protected and secure, letting you concern yourself with other aspects of your daily life. Thieves can be anywhere and can be anyone, so it is important to be aware of the conditions at all times. If you are not consistent with your secure methods, you may end up the victim of thievery or robbery. The following are some methods you can utilize to ensure your belongings are always secure. One trick thieves often use to gain an advantage is to keep track of the travel plans of their targets. To avoid this, only discuss your traveling plans with people who need to know, such as family members or house-sitters. Try not to announce your plans on a social media site like Facebook. It then becomes public knowledge and can be used against you. The last thing you need is to come home from a vacation to find that your home has been broken into and your belongings stolen. Lock styles come in a variety of forms, but the more secure ones are definitely worth the money. Having locks that are tougher to pick or break through is a great way to deter possible thieves and keep to secure living. Their ultimate goal is to complete a job as quickly as possible. Having locks that are difficult to break through can force them to change their plans and leave without doing any damage. There are also electronic locks available that work with fingerprints and other methods that will only allow certain people through. Investing in better locks means your things will be better secured. Safes are great investments for your more confidential documents and contribute to a secure living lifestyle. Keeping your passports, social security cards, and tax documents in a safe keeps them secure from not only thieves and burglars, but also natural disasters such as fires or floods. A safe can mean the difference between a lot of hassle and a situation that won’t cause you many problems. Keep a safe for your belongings and rest easier.